As soon as the temperatures started to dip, I got it into my head that Stephen and I just had to visit a corn maze before the fall season was over. 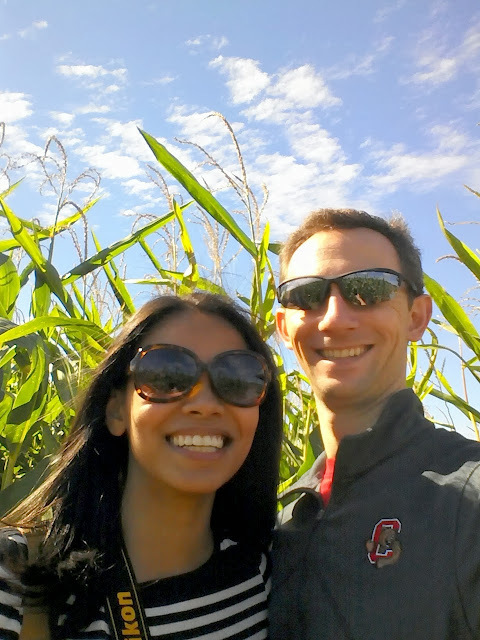 (I've never done a corn maze before.) But since that's not exactly the type of event that would draw us out of the house on a weekend, I thought the chances of actually checking that item off my to-do list were slim. That is, until I won a radio contest that left me with tickets to the Fall Festival at Grim's Greenhouse in Breinigsville. Turns out, we had a lot of fun! And, as much as I hate to admit it... The corn maze was harder than we thought it would be. Especially given we found our first dead end within minutes of walking into it. At any rate, Stephen and I had a lovely day and even got some apple picking in. But now, it's time to dig in and tackle our regular Sunday to-dos. Here's our Menu Plan for the week!